AP Buildings Revision of rates of rent for the Private Buildings taken on lease by the Government as per G.O.NO: 37 ; AP G.O.NO: 37 Revision of rates of rent for the Private Buildings taken on lease by the Government ; Buildings Revision of rates of rent for the Private Buildings taken on lease by the Government as per G.O.NO: 37. AP G.O.NO: 37 Revision of rates of rent for the Private Buildings taken on lease by the Government. 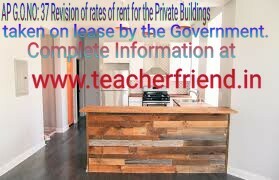 AP Buildings – Private Buildings occupied by Government Departments – Revision of rates of rent for the Private Buildings taken on lease by the Government Departments – Orders – Issued. Private Buildings on lease by Government Departments and fixation of rent thereof. But it was noticed that rent fixation in practice has become quite cumbersome and leading to wasteful expenditure. Therefore, Government have issued comprehensive order as per G.o.No:37. G.O.Ms.No.601, G.A. (Accommodation) Dept., Dt.29-08-1979. Govt. Memo.No.791/Accom.A2/82-1, G.A. (Accom.A) Dept., Dt.30-09-1982. G.O.Ms.No.35, Fin. & Plg. (FW-EBS-PWD) Dept., Dt.27-02-1997. Govt.Memo.No.127/R&E/97 Fin. & Plg. (FW-R&E) Dept., Dt.09-06-1997. G.O.Rt.No.2120, Fin. (EBS-XI) Dept., Dt.28-07-2015. Government have issued instructions from time to time about the procedure and norms for taking Private Buildings on lease by Government Departments and fixation of rent thereof. But it was noticed that rent fixation in practice has become quite cumbersome and leading to wasteful expenditure. Therefore, Government have issued comprehensive orders in the G.O. 5th read above fixing the rent for the Private Buildings taken on lease by the Government Departments duly classifying the areas in to six categories. Again in the G.O. 7th read above, rents for the Private buildings ware revised as detailed given below Download link..